This beautiful chess set combines the amazing National Museum Scotland Lewis Chessmen with our stunning Palisander chess board. The official Lewis chessmen have been a huge seller over the years and we're delighted that this red box mid sized version is finally available. (See the version in the black box for a larger size if required). 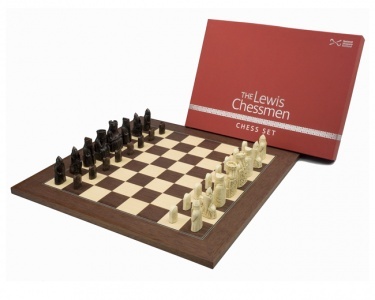 Finally you can own a set of Official Isle of Lewis chessmen and accommodate them on a modest sized chess board. At just over seventeen inches this set is the perfect size and won't take up too much room if you decide to leave it out. The chessmen come in a superb gift box that provides a permanent storage solution. They have been crafted from real stone composite to an excellent standard. Made in England and developed by the worlds experts on Lewis chessmen, there is no better set of Lewis chessmen to own.